It was a dream opening for hosts Russia at the 2018 World Cup. After a low-key opening ceremony, featuring Robbie Williams and Russian President Vladimir Putin telling everyone to put their differences aside, the Russians delivered on the pitch. Manager Dimitry Cherchesov and his players have now given the nation a solid chance of qualifying to the second round from Group A. 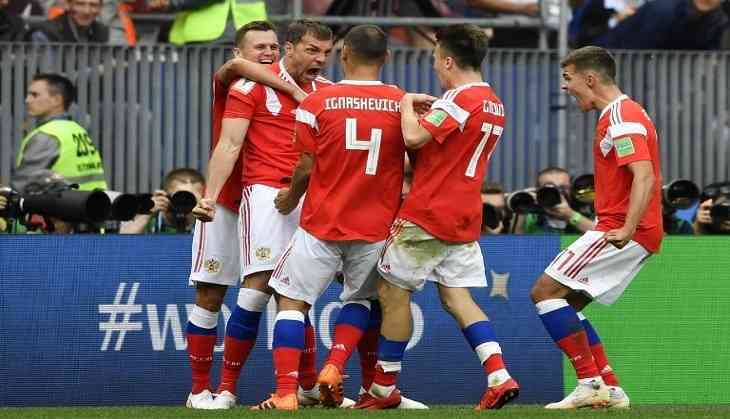 The Russians won by the biggest winning margin in the history of opening matches at the FIFA World Cup. Yuri Gazinskiy, Denis Cheryshe (with two), Artem Dzyuba and Aleksandr Golovin were on the scoresheets for the Russians. It was a 5-0 routing of the Saudis. The only negative for the hosts was when Alan Dzagoev had to be substituted with what was looking like a serious injury. The opening goal was scored by Yuri Gazinskiy in the 12th minute and it was no turning back for the hosts. The Saudis looked out of place despite holding a large amount of possession. They offered little to no resistance at the back. What turned the match was the substitution of Dzagoev. In place of Dzagoev came Cheryshev who ended up scoring twice on the night. In fact, Russia’s second, third and fourth goals were from substitutes. Neither of the teams have been worldbeaters in recent times. The Saudis are full of players who play in their home league, while some of the Russians manage to ply their trade in the European leagues. But on Thursday, Russia outclassed the Saudis who thoroughly lacked imagination. Though they held the ball more, they just couldn't push it past the Russians, forget taking shots at the goal. The two flanks were left largely unused by the Arabs despite the Russians frustrating them in the middle of the pitch. With two goals in the last few minutes of the game, the scoreline turned for the worse for the Saudis. The late goals may have seemed unfair or unlucky to the Saudis but they perfectly summed up the night. For Russia though, the easy match has been done and dusted with. The victory gives them a real good chance to qualify out of Group A but their next two matches against Egypt and Uruguay will prove to be much sterner tests and victory will not at all be guaranteed. With Russia being the lowest ranked side at 70 and Saudi Arabia not much higher at 67, not much was expected from the opening match. By the end of the match though, the 81,000-capacity Luzhniki Stadium had plenty to cheer about. Russia next plays Mohammad Salah’s Egypt in St Petersburg on Tuesday, 19 June. Saudi Arabia faces Latin America side Uruguay on Wednesday, 20 June.